Having expanded their horizons since the early days of importing only French wines to sell direct to the public, therefore cutting out the ‘middle man’, From Vineyards Direct still has fabulous connections in France via its two owners and founders, which allows them to source parcels of often excellent wine, at very competitive prices. 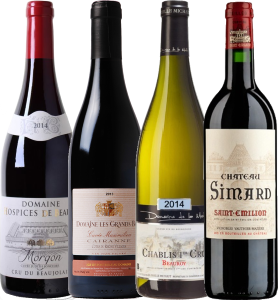 This small selection of six wines contains some really good buys, and a couple of bottles of each could constitute a pretty smart Christmas drinking or entertaining mixed case. (2016) I love the peach and nectarine downy and delicate aromatics of this wine, glistening with dew=drop freshness. On the palate a little hint of something flinty, but also of the passionfruit exoticism and indeed, a touch of nettle, pressing all the Sauvignon buttons is a beautifully clear and dry, restrained yet welcoming style. Truly lovely stuff, but unfortunately out of stock with FVD at time of review, so I have included a wine-searcher link to find other stockists. (2016) Tasted just over a year ago, this wine really impressed: a Chablis Premier Cru with a touch of creamy oak to smooth the pristine Chablis apple and flint character. Now, the wine tastes just as sleek and refined, but that vivacious core of steely precision is even more evident, wrapped in a sheen of oatmeal but riveting in its freshness and vitality. A great price for a Premier Cru of this undoubted quality. (2016) FromVineyardsDirect's co-owner, Esme Johnstone, has many connections in Bordeaux, being the ex-owner of Château de Sours, presumably helping him unearth this 50/50 blend of Cabernet Sauvignon and Merlot from organically-farmed vineyards close to St Emilion. It's an approachable and easy-drinking style of claret, plenty of buoyant fruit and a firm touch of graphite, there's a bit of sinewy grip that develops, but all smoothed by the gloss of the fruit and its quite creamy texture. (2016) From one of the top Beaujolais Crus, this is an attractively spicy and black-fruited interpretation of Gamay, very focused, tight and mineral-flecked aromas that are firm. On the palate that's the story too, a chewy and firm core of tannins and acidity, underpinning savoury but extremely juicy black berry fruit, precise and shot through with energy. A lovely wine. (2016) This estate was purchased by Alain Vauthier of Château Ausone in 2008. It feels youthful yet approachable, with touches of cedar and stemmy green Cabernet to solid black fruit (that some will like more than others), though the elegant framework of supple tannin, easy acidity, coffee and fruit concentration harmonious on the palate. Drink or hold for a few years.